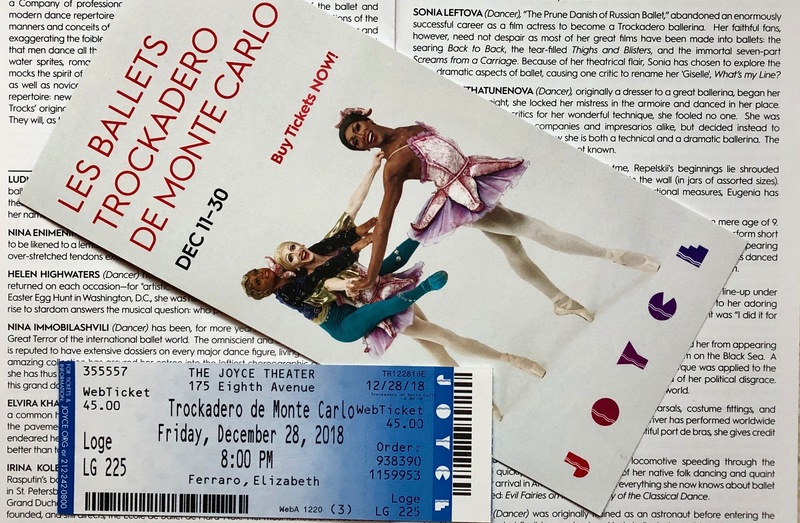 Lizzie saw an ad for Les Ballets Trockadero de Monte Carlo in one of The New Yorker issues lying around the house and got four tickets including Charlotte, me, and one of her friends. She knew the show was the day after her wisdom teeth extraction surgery. To accommodate her recovery and save on commute, Tom offered to drive. The day was rainy and foggy. By the time we had to leave, it was pitch black. The friend bailed out. I didn’t sleep well the night before and was really tired. Five minutes prior to the departure, Tom was in bed completely out, catching up after his 5 AM shift at work. Charlotte made it known that she only wanted to go to spend time with Lizzie and was ok staying home. Lizzie did not come out of her room since last night and had not eaten all day. Just in case, Charlotte and I were ready — sort of — both secretly hoping to stay home. The weather was the most dreary weather of the year and thoughts of Friday night Christmas commute to the city were not enticing. Lizzie came downstairs — all made up, swelling patched up, and ready to go — as if she hadn’t had her four wisdom teeth taken out the day before. Tom got out of bed. Tom has this amazing ability to go from being completely asleep to full speed action on Route 17 in less than five minutes — ablutions included. Our ride to the city was amazing. Lights were turning green as we were approaching them and cars were moving out of our way. This never happens to anyone! The magic of the season got us to the door of the theatre and provided a street parking spot around the corner in less than an hour. It was meant to be. Once we got over differences in our expectations and Tom took the ticket and place of the bailed-out friend, it felt so great to be in the city — all four of us, together — among those people, and lights, and music, and smells. The theater, the stage, the atmosphere, the vibes! Thank you, Lizzie, for spotting this show, getting the tickets, and bringing us here. Thank you, Charlotte — for your composure and being game. And Tom. The house was packed. It was obviously sold out. New York theatre crowds are special. People are open, accepting, and easy to talk with. Here’s the woman who brought a box of chocolates and was offering it to those on the right, and left, and above, and below. Just because it felt good to give. 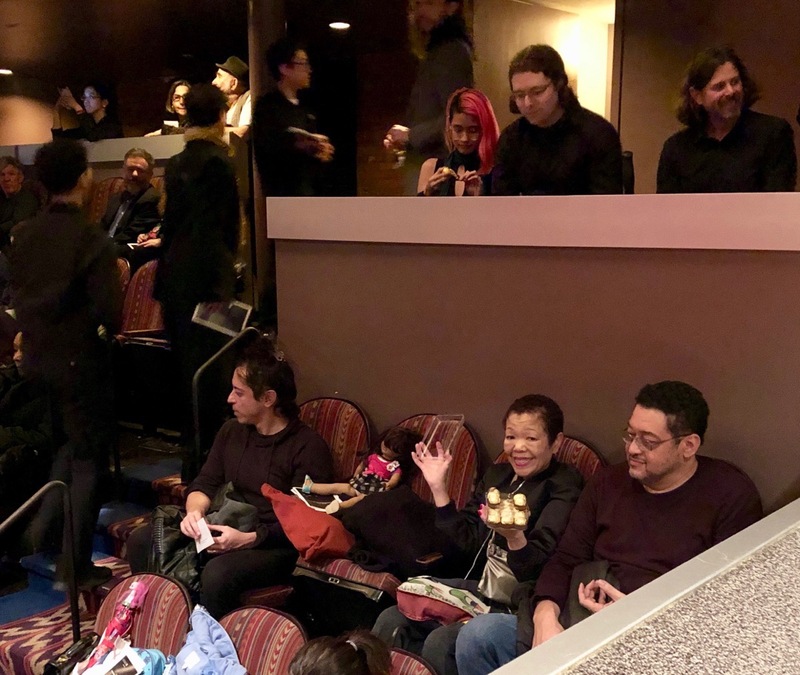 We got to our seats really early and had plenty of time to check out the playbill — I have never heard of this ballet company before. Le Ballets Trockadero de Monte Carlo is an all male drag ballet company that has nothing to do with Monte Carlo. The company got going in the 70’s mostly in off-off-Broadway spaces in New York. They stage versions of classical ballet mocking its rigid gender, size, and partnering requirements. In Trocks’ versions, male and female parts are performed by men of all colors, shapes, and sizes with unimaginable partnering. The dancers show not only incredible ballet technique and strength, they mix in pantomime and acting. 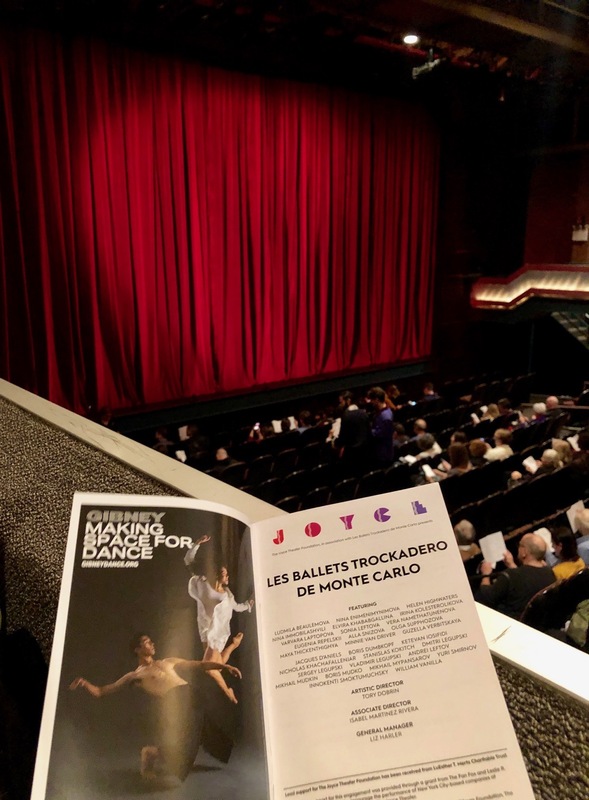 What they do is definitely attractive to ballet aficionados as there is a good deal of insider jokes that not everyone would get but it would be also entertaining to those foreign to dance. They are great dancers — one has to be perfect executing the moves correct way to perform them incorrectly — and great comedians. This performance brought to mind Igor Moiseyev Ballet, a Russian dance company, that also goes against conventional ideas of ballet body, partnering, and repertoire. Nina Enimenimynimova is an elfin charmer likened to a lemon souffle on a brink of a total collapse. Irina Kolesterolikova was discovered adrift in a basket on the Neva River along with Rasputin’s boot, grand jetéd into Tsar’s box during her debut in Mariinsky, impaling a Grand Duchess, and banished from Russia. Her famous warm up consists of a martini and an elevator. Varvara Laptopova carries a first prize award from Pan Siberian Czardash and Kazotski Festival for artistic mis-interpretation. Sonia Leftova abandoned her film career after starring in films like Back to Back, Thigh and Blisters, Screams from a Carriage. Vera Namethattunenova was a dresser to a great ballerina and started dancing when she locked her mistress in the armoire and went on to dance in her place. Alla Snizova developed serious allergy problems and could dance only short pieces. Maya Thickenthighya, her torque was applied to the running of Generator 14 near the Gorsky Dam. There were The Legupsky brothers, who were not really brothers, nor could they tell the difference between a pirouette and a jeté but they did move rather nicely and they fit into the costumes. And speaking of costumes — those size 15 pointé shoes were impressive! Before the curtain went up, the mood was set by the voice rolling exagerrated Russian “r’s” announcing that “in accordance with the greatest traditions of Russian ballet there will be changes to this program.” Warnings of the dancers’ moods, names, biographies, food preferences, substitutions followed. The show opened with the second act of Swan Lake, a nod to the 19th century Russian classical ballet. For most part, it was obvious that those were grown men in tutus and tiaras dancing en pointé. But some of them had feet, and arches, and extensions that would made any professional female ballet dancer envious and make you forget that it was a parody and not a classical version. The original Lev Ivanov’s choreography was mixed with pantomime that involved exaggerated makeup, infamous floss dance, skillfully orchestrated mishaps, and some audible tantrums of dancers. The second act started with The Harlequinade pas de deux which was not as funny but extremely complicated technically. Two dancers, I believe they were Long Zou and Takaomi Yoshino — those are their real and not stage names — were brilliant technically and artistically. The audience was breathless and rewarded them with a standing ovation. In La Troviatiara pas de Cinq, channelling Guiseppe Verdi’s La Traviata, three giant women were partnered with two short men. The difference in height was so drastic that male characters were easily ducking under the outstretched leg of a female character turning en pointé in arabesque. The third ballet of the second act, The Dying Swan, started with a spotlight frantically searching the stage — right and left — for a dancer. Probably that searching spotlight was a bow to Anna Pavlova for whom this piece was originally choreographed by Mikhail Fokine at the start of the 20’th century. The story has it that during Pavlova’s funeral the spotlight was shining onto the empty stage as the Camille Saint-Saëns’s music was playing. Finally Trocks’ spotlight stumbled on a stalky muscular swan bouréeing across the stage — signature fluid arms — in a tutu endlessly shedding feathers onto the stage and leaving a trail behind the somewhat gliding neckless swan. It seems like a lot of Fokine’s choreography was there but it was static. When the mostly posing swan finally decided to move, something went wrong, his knees wobbled making hims squat en pointé in a wide second position — only those who know would understand how hard it was to stay upright in this position en pointé — and it looked like he threw out his back. Hunched and grabbing his waist, the dancer tried to run off the stage, but got tangled in the wings, and eventually was pushed back by someone to finish the performance. The stalky swan fell, got up, dusted himself off, and tried to stick some feathers back to the costume. He looked up to the audience for understanding and support. The pantomime there — people, you feel my pain — was amazing. The final act was an underwater scene from The Little Humpback Horse, another Russian fairytale ballet. It looked like most of the troupe was on stage. Their pointé work was impressive, their energy was spilling into the audience, those multiple fouettes, the extensions, the artistry making everything look so easy and fun, the costumes — jellyfish being my favorite. Surprisingly, we were allowed take pictures during the performances — only videotaping and flash photography were prohibited. I got so excited: how great — I will be taking pictures and lots of them! But the artistry and comedy were so contagious that I forgot about the camera and and the phone. No, I didn’t. But I didn’t want to waste a single moment looking through a lens. I couldn’t miss any of the real thing. Now The Trocks are on a tour all over the country and the world. Can’t wait for them to come back to New York. I truly enjoyed reading about your family outing to the ballet! I especially loved the rendition of each of the dancers! Sometimes things work out just perfectly. Family time was just meant to be. We need friend time soon. The kids will be back to their respective states of study and our days will be quiet as well.